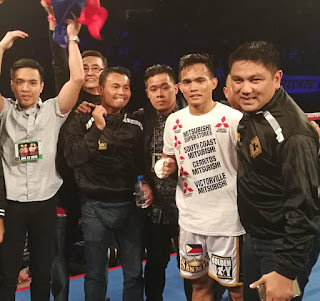 Press Release: January 28, 2018 – By Sanman Promotions Filipino fighter Romero “Ruthless” Duno continued his winning form by knocking out Mexican Yardley Suarez in the first round Saturday night at the Forum in Inglewood, California. Duno’s impressive victory was his third straight win in the US under the Golden Boy Promotions. The 22-year old boxer from Sanman Boxing Gym in General Santos City landed a right hand to the body followed by a solid right on the head for the knockout. Duno had previously won by a unanimous decision against another Mexican Juan Pablo Suarez last Sept. 23 at the Forum. He made his grand debut in the US with a shocking first round knockout against then-unbeaten Mexican Christian Gonzales (16-0) last March 10 at the Belasco Theater in LA to capture the vacant WBC Youth Intercontinental Lightweight title. For more about Sanman Promotions and to watch the exclusive Sanman Live Boxing series please visit Sanman Promotions’ official Facebook page: www.facebook.com/Sanmanpromotions. The official weigh-in for Saturday’s Premier Boxing Champions card at the Barclays Center in Brooklyn, NY headlined by undefeated IBF Welterweight world champion Errol Spence defending his championship against former Jr. Welterweight world champion Lamont Peterson took place earlier today in Brooklyn, NY. The official weights for the entire card are as follows. Main Event: IBF Welterweight world championship – 12Rds. Errol Spence (Champion) 147lbs. vs. Lamont Peterson (Challenger) 146 3/4lbs. Iago Kiladze 220 1/2lbs. vs. Adam Kownacki 260lbs. Marcus Browne 175 3/4lbs. vs. Francy Ntetu 174 1/2lbs. What’s Next For Claressa Shields? When one thinks of notable names throughout the history of Women’s Boxing some will likely recall fighters such as Ann Wolfe, Christy Martin, Holly Holm, Laila Ali, Lucia Rijker, Deirdre Gogarty, and Mia St. John. All fighters who became world champions throughout their careers and became stars of the sport. A new name has emerged to become a star of Women’s Boxing. Undefeated unified WBC/IBF Super-Middleweight world champion Claressa Shields. Shields, a native of Flint, MI emerged on the scene when she won an Olympic gold medal in the 2012 Olympics in the Middleweight division, the first time Women’s Boxing was included in the Olympic Games. Shields went on to become a two-time Olympic gold medalist at the 2016 Olympics in the Middleweight division. After becoming only the second American boxer to win two Olympic gold medals, joining Oliver Kirk, who won two gold medals at the 1904 Olympics as a Bantamweight and Featherweight, and compiling an incredible record of 77-1 as an amateur, Shields embarked on a professional career turning pro in November 2016 where she scored a four round unanimous decision over Franchon Crews. After scoring two more victories over Szilvia Szabados and Sydney LeBlanc, Shields challenged unified WBC/IBF Super-Middleweight world champion Nikki Adler in August of last year and stopped her in the fifth round to become a world champion in only her fourth professional fight. Although it is a rare achievement for a fighter to win a world championship so early in their professional careers, Shields did compete in seventy-eight bouts as an amateur and this along with her Olympic pedigree has allowed her to gain experience, which not all fighters at similar stages of their professional careers are necessarily able to have. This all led to Shields’ first title defense on January 12th at the Turning Stone Resort and Casino in Verona, NY against top contender and former two-division world champion Tori Nelson. This was an interesting fight in my eyes as it not only represented Shields’ first title defense, but much like her bout against Nikki Adler, the new champion would be going against an opponent with considerable professional experience, who was unbeaten in twenty previous professional bouts and had won world championships in both the Welterweight and Middleweight divisions. What impressed me about Shields in this fight was her composure in establishing the tempo of the combat. Shields established a pace where she was able to consistently get her punches off first and gradually outwork Nelson and did not allow the former world champion much of an opportunity to turn the tempo of the fight in her favor. It was equally impressive however; that Shields faced an opponent in Nelson who was very “Game” and took everything the champion threw at her and kept coming forward. Shields would retain her world championship by scoring a ten round unanimous decision. This was a crucial fight in Shields’ career thus far in my eyes because she was fought a former world champion, who showed resistance and was able to extend her to the ten round distance for the first time in her career. As for what is next for Claressa Shields a potential move down in weight to face undefeated unified WBC/WBO Women’s Middleweight world champion Christina Hammer appears likely. Although some may question whether it is a risk for Shields to move down in weight, it is important to remember that fighters such as Ann Wolfe and Christy Martin won world championships in multiple weight classes throughout their careers and from a standpoint of what fight could not only draw considerable interest not only for the bout itself, but also for the sport of Women’s Boxing, it would be a battle between two undefeated world champions. In terms of Women’s Boxing history, some might recall the battle between Christy Martin and Deirdre Gogarty that took place on the undercard of Frank Bruno’s WBC Heavyweight championship title defense in his second fight with Mike Tyson on March 16, 1996. A fight that was featured on the pay-per-view portion of that card here in the United States that frankly was the fight of the night on that card and one of the best fights in Boxing overall in 1996. Women’s Boxing was elevated from the Martin-Gogarty fight and the sport was able to gain much needed exposure due largely to the platform that Showtime, one of the sport’s top premium television networks was able to provide Women’s Boxing both on their network as well as their pay-per-view cards at that time. Although networks have showcased Women’s Boxing from time to time in the years since, there is so much more that could be done to elevate the sport. A fight between Christina Hammer and Claressa Shields could represent the next step in the evolution of the sport of Women’s Boxing. As the sport of Mixed Martial Arts (MMA) has proven Women’s combat sports is growing and it is time for Women’s Boxing to be presented in a similar fashion as Women’s MMA has been over the last several years. While some might disagree, this observer believes the timing is right for Women’s Boxing and a Hammer-Shields encounter if it does happen, will be a step forward in that process. Although the landscape of television as a whole has changed considerably over the last twenty-two years due in large part to the advent of Over The Top (OTT) digital distribution, it is great to see a network like Showtime once again leading the way for providing a platform for Women’s combat sports as they also played a significant role in showcasing Women’s MMA during its early years, much in the same way as they did in showcasing Women’s Boxing back in the 1990s. It is my hope that other networks on traditional television cable/satellite, over the air (OTA) as well as digital OTT networks recognize the potential to help grow Women’s Boxing. As I have said on several occasions, it is long overdue. 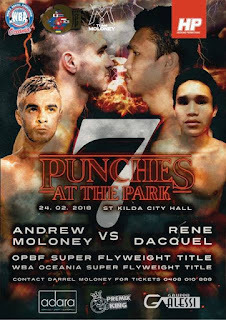 Champion vs. Champion Set For "Punches At The Park 7"
Press Release: January 14, 2018 (Originally Released on January 12, 2018) by Gary Farmer - Unbeaten Super Flyweight sensation Andrew “The Monster” Moloney (15-0, 10 Kos), returns for the biggest test of his professional career February 24 at St Kilda City Stadium in Melbourne Australia for "Punches in the Park 7". 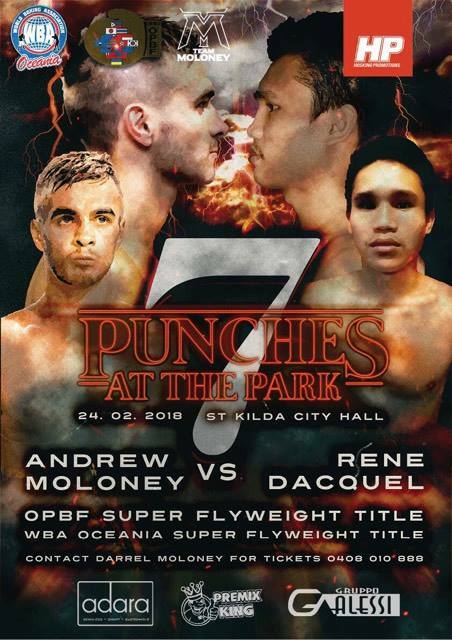 Moloney puts his coveted WBA Oceania title & World rankings on the line (WBA #6, IBF #10, WBC #18) as he challenges IBF #5, WBC #11, WBO #12 Rene “The Commander” Dacquel 20 (6) – 6 -1 for his OPBF Championship. “The OPBF is a very prestigious belt especially in Japan where boxing is booming at the moment. I claimed the OPBF Silver title in August last year and I don’t like being second to anyone so it’s only right that I now take on the full champion and become number 1. I’m expecting this to be the toughest fight of my career. Dacquel has beaten some very good fighters, winning and defending his OPBF title 3 times in Japan. I’m sure he is not going to want to let go of his title easily” states Moloney. The 26 year old Dacquel is no stranger to traveling; “The Commander” has traveled 7 times in professional career having defeated South African Thembelani Nxoshe in 2015 his hometown for the IBO International Super Flyweight Title in South Africa. The Commander has been on as a roll after winning the OPBF Title in Bacolod City, Philippines in 2016 has defended the coveted title 3 times all in Japan earning his universal World rankings. “The Monster” a 2012 Glascow Commonwealth Games Gold Medallist is no stranger to the Gold as in the pro ranks he has won the Australian state , National & WBA Oceania Bantamweight titles all in his first 5 fights. 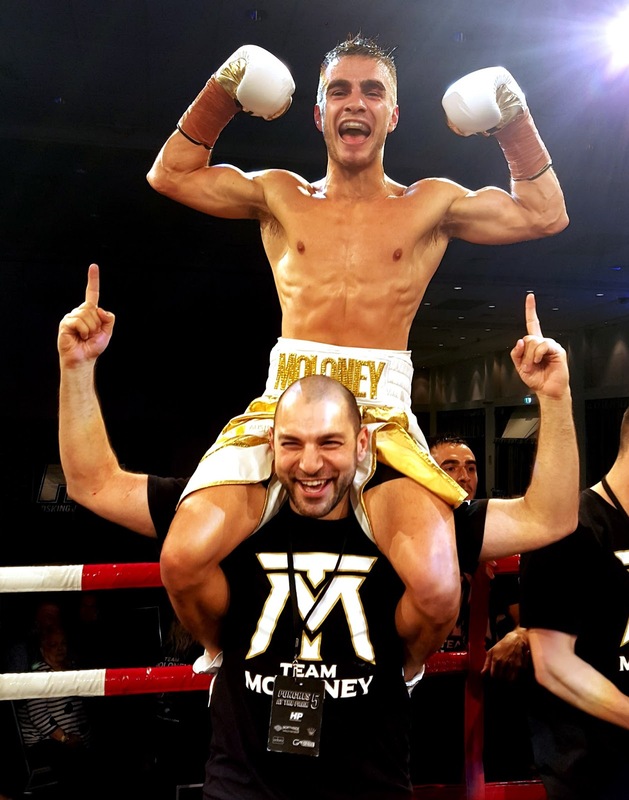 Moloney the current 115lbs WBA Oceania, Commonwealth & OPBF Silver Champion puts in all on the line Feb 24 as Team Moloney target WBA Super Flyweight World Champion Khalid Yafai of England. Moloney added “It is an honor to represent the WBA and to be ranked #6 in the world by the longest standing sanctioning body in boxing history. I have watched a lot of Yafai’s fights. I hope he holds onto his title because I honestly believe I will beat him. There is no doubt that the Super Flyweight division is one of the most stacked divisions in boxing, but I believe I can match it with all these guys. At the rate I’m improving under Angelo Hyder it won’t be long before I take over the division. The Super Flyweight division is on fire at the moment and with Punches in the Park 7 & Super Fly II at the Stub Hub Center in Carson, California are both on the same date. The winner will make a strong case for Super III. Twin Brother Jason will Headline the Hosking Promotions “Punches in the Park 7” bill as Twin Brother defends his WBA Oceania Bantamweight title and challenges Namibian Immanuel Naidjala for the vacant Commonwealth title. Material Courtesy of: Gary Farmer Photos Courtesy of Tony Tolj Used with permission. The official weigh-in for tonight’s first card of 2018 for Showtime Sports’ popular ShoBox: The New Generation series headlined by a battle for the unified Women’s WBC/IBF Super-Middleweight world championship between undefeated world champion Claressa Shields and undefeated top contender Tori Nelson took place on Thursday in Verona, NY. The official weights for the entire card are as follows. Main Event: Women’s WBC/IBF Super-Middleweight world championship – 10 Rds. Claressa Shields (Champion) 167lbs. vs. Tori Nelson (Challenger) 164 3/4lbs. Shohjahon Ergashev 140lbs. vs. Sonny Fredrickson 141lbs. Tiffany Woodard 166lbs. vs. Franchon Dezurn 169lbs. Maurice Chalmers 141 1/2lbs. vs. Bakhtiyar Eyubov 143 1/2lbs. Jesse Hernandez 122 1/2lbs. vs. Ernesto Garza 122 1/2lbs. Alexey Zubov 206 3/4lbs. vs. Lamont Capers 194 1/4lbs. Garrett Wilson 210lbs. vs. Apti Davtaev 245lbs. ShoBox: Shields vs. Nelson takes place Tonight (Friday, January 12th) at the Turning Stone Resort and Casino in Verona, NY. The card can be seen in the United States on Showtime beginning at 10PM ET/PT and will also be streamed live on the Showtime and Showtime Anywhere apps. Check your cable/satellite provider for time and channel in your area. For more information about Showtime, Showtime Sports, and the Showtime and Showtime Anytime apps including available devices please visit: www.sho.com. Check your listings internationally. "A Boxing Wishlist For 2018"
A new year here at The Boxing Truth® means it is time for what readers have come to know as a “Wishlist” of what this observer feels could benefit the sport of Boxing in the year ahead. The year 2018 appears to be in a good position to continue the momentum of what should be viewed as a successful 2017 and overall success over the last several years for the sport. As is the case with most “Wishlists” one often does not get everything they might want at once and as such some things that have been on this observer’s “Boxing Wishlist” in previous years remain on my list as 2018 begins. Readers might recall at the beginning of 2017 I stated that in terms of a rematch of an encounter that was a candidate for “Fight of the Year” honors that I wanted to see during the year was between undefeated two-division world champion Andre Ward and Sergey Kovalev. The rematch between the two did indeed take place during 2017 with Ward emerging victorious in what turned out to be his final fight as he retired shortly after what was his second victory over Kovalev. Much like last year, there is one fight that many including yours truly want to see a continuation of in 2018. 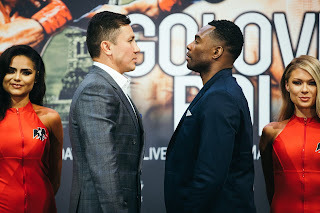 A rematch between undefeated unified WBA/IBO/IBF/WBC Middleweight world champion Gennady Golovkin and former two-division world champion Saul Alvarez. Much as was the case with the first encounter between Sergey Kovalev and Andre Ward in 2016, opinion as to who got the upper hand in the battle between Golovkin and Alvarez, an encounter ultimately declared a draw, were mixed and set up an ideal scenario for a rematch. Whether or not a second encounter between Golovkin and Alvarez takes place in 2018 remains to be seen, but if it does indeed happen it could lead to something that has been a regular item on my “Boxing Wishlist” in previous years. Unification of all world championships to determine one “Undisputed world champion” per weight class. Obviously, with seventeen weight divisions in the sport this is one item/wish that is extremely difficult to obtain for a variety of reasons, but in terms of the 160lb. Middleweight division, this is something that could be accomplished sooner rather than later. There are currently two world champions in the Middleweight division with Golovkin and undefeated WBO world champion Billy Joe Saunders. Saunders emerged victorious by producing a dominant performance in winning a twelve round unanimous decision over former IBF Middleweight world champion David Lemieux on December 16th in Laval, Quebec, Canada. Saunders has successfully defended his portion of the World Middleweight championship three times since winning the championship in 2015 and off of the strength of his victory over Lemieux seems to be the logical option for the winner of the potential Golovkin-Alvarez rematch. On the subject of further unification throughout the sport, it would appear that Boxing’s Heavyweight division could also be in a position to make further progress toward determining one “Undisputed World Champion” in 2018. With Deontay Wilder, Anthony Joshua, and Joseph Parker each holding portions of the World Heavyweight championship, it will be interesting to see if a bout featuring two out of the three champions will take place in the first half of the year. Although the ideal scenario in my eyes would be for a bout between two of the three current champions to be made with the provision that the winner goes on to face the third champion to determine the “Undisputed Heavyweight World Championship “ before the end of the year, I believe it is more likely when one factors into the equation the potential of injuries as well as the annual mandatory title defense obligations that a fight to determine one champion may be more likely for 2019. If further progress toward the goal of that taking place is made this year however, it should be viewed as beneficial to the sport. Longtime readers are probably familiar with other items that have been discussed in previous years that have been on the “Boxing Wishlist.” Items such as the established dialogue between Boxing’s various sanctioning organizations to discuss issues that surround the sport and to hopefully work together in order to benefit Boxing in the long-term. There was not much made public about the dialogue that was established in 2014 involving the leaders of the World Boxing Council (WBC), the World Boxing Association (WBA), and the International Boxing Federation (IBF). It is my hope not only that the dialogue that was established between the three sanctioning organizations resumes in 2018, but also grows to include the leaders of the World Boxing Organization (WBO) as well as the International Boxing Organization (IBO) as I have said in previous years. In order for true progress to be made, this observer believes that all five major world Boxing sanctioning organizations should be involved in whatever discussions might be with the goal of ultimately benefiting the sport and it’s fans. There is however, one aspect of the sport that will hopefully garner the attention and recognition it deserves in 2018. Women’s Boxing. It should be no secret to longtime readers that I have long been an advocate for Women’s Boxing and feel that valuable television exposure as well as a spotlight on some of the major pay-per-view cards that take place throughout a calendar year has been long overdue. Readers might recall a bout that took place on the undercard of the Shane Mosley-Ricardo Mayorga rematch in August 2015 for the IBF Women’s World Jr. Featherweight championship between Yulihan Luna and Maureen Shea. A bout that was fought to a ten round split decision draw, which was the first Women’s world championship fight to be featured on a pay-per-view Boxing card in the United States in well over a decade at that point. In my coverage of that card, I stated that it was my hope that the spotlight of the sport focused more on Women’s Boxing in the future. Many fans are probably familiar with two-time Olympic Gold medalist Claressa Shields, who turned professional in November 2016 and has since won four fights including becoming a unified world champion in her last fight against Nikki Adler in August of last year. The unbeaten Shields will make the first defense of her unified WBC/IBF World Super-Middleweight championship on January 12th against undefeated top contender Tori Nelson in Verona, NY in a fight that will headline a card televised here in the United States by Showtime Sports as part of their popular ShoBox: The New Generation series. This will be Shields’ second fight broadcast by Showtime and it should represent an important step forward for the sport of Women’s Boxing overall. In an era where many Women’s Mixed Martial Arts (MMA) stars have been showcased in main events on major pay-per-view cards, it is now time for Women’s Boxing to be showcased in a similar fashion. Whether or not a major Boxing “Pay-Per-View” event headlined by a women’s world championship fight on a card also featuring men’s bouts is closer to becoming a reality remains to be seen, but it is something I want to see happen. It is long overdue. Finally to wrap up this year’s “Boxing Wishlist”, the subject of “Pay-Per-View.” It should also be no secret to longtime readers as well as those who know this observer that I have also been a strong advocate for Over The Top (OTT) digital distribution and have established a dialogue from time to time discussing the benefits that the distribution model could have for Boxing. Readers might recall a column this observer wrote on the subject in December 2015 titled “Is It Time For “Big Time” Boxing To Go Over The Top” where I first discussed the evolution of what we know as “Pay-Per-View” and the changing landscape as OTT distribution has gradually become a preferred choice of consumers over traditional cable/satellite pay television. In the years since I wrote that column, OTT as a distribution model as well as a preferred option for consumers has only continued to grow as more options including streaming services as well as A la carte live television services delivered exclusively over the internet have been introduced including YouTube TV, Hulu Live TV, Sling TV, and DirecTV Now just to name a few. As streaming services ranging from sports, general entertainment, movies, Broadway, and others continue to be introduced, it is my hope that a streaming service aimed exclusively for Boxing is eventually introduced. Although there have been digital networks such as Fite TV, FloSports, EverSport, GFL Combat Sports, YouTube, Facebook, and others that have been successful offering Boxing either as a digital “Pay-Per-View” option offering lifetime on-demand access included with purchase of an event, or as part of a subscription model which includes other sports, or as free events in some cases, I believe it is long overdue that Boxing join the future with a direct to consumer OTT subscription model, which would include live events from around the globe as well as on-demand access as part of a subscription. Readers have likely heard me suggest on more than one occasion that a model for such a digital Boxing network/streaming service can be found in the United Kingdom’s BoxNation cable/satellite network. The subject of an affordable OTT subscription option for Boxing has long been “A Wish” for this observer primarily for the benefits that it would offer Boxing fans overall who cannot afford to pay what has become increasingly high prices to watch Boxing’s top stars compete on cable/satellite “Pay-Per-View.” Even though there are still exceptions where Boxing still produces significant numbers in terms of buys of cable/satellite pay-per-view cards, most cards underperform in terms of overall buys and that has only continued over the years as prices have gone up and “Cord-Cutting” by consumers choosing to bypass traditional pay television has increased, but it has also led to a change where more marquee fights are now being made available live either on traditional over the air (OTA) television or on cable with networks such as ESPN, Fox, CBS, Showtime, and HBO all striving to bring the best fights possible to their audience. While it may be true that the rare exception of a “Big” or “Major” event can still produce sizable pay-per-view revenue as was the case with the Floyd Mayweather-Conor McGregor bout in August of last year, which generated 4.3 million pay-per-view buys of an event that was priced at nearly $100, Boxing should and frankly needs to take a step toward a subscription-based OTT option much as the Ultimate Fighting Championship (UFC) and World Wrestling Entertainment (WWE) have done with their respective digital networks. Although the UFC still puts on pay-per-view events, with those events being added to their UFC Fight Pass digital network on a delayed basis, I believe that there will come a time where eventually the UFC’s pay-per-view events will be made available live as part of a subscription to their Fight Pass digital network. As for World Wrestling Entertainment, some may recall the backlash the company dealt with shortly after the announcement of their WWE Network subscription-based OTT network at the International Consumers Electronics Show in Las Vegas, NV in January 2014 with several cable/satellite providers refusing to carry WWE pay-per-view events, due to those events being available live and included as part of a WWE Network subscription. Despite that backlash, WWE has shown that it can succeed without traditional cable/satellite pay-per-view with a subscriber base that has gradually been approaching two million paid subscribers paying a price of $9.99 a month even though there are some providers that still offer those pay-per-view events to their subscribers even on a selective basis. The idea of a digital network delivered exclusively on an OTT basis dedicated to Boxing at a similar price as WWE Network and UFC Fight Pass, which both cost $9.99 a month may seem far-fetched and no pun intended “Wishful Thinking”, but I feel that is only a matter of when and not if Boxing as a whole will need to adapt to the changing times and landscape of technology. While it may also be true that some of the recent cable/satellite pay-per-view Boxing cards that have also been offered on a one-time live showing OTT basis have not done well and in some cases have resulted in litigation regarding problems customers had streaming those events resulting in some getting refunds of their purchase, if there is a dedicated effort between promoters throughout the sport as well as some of the networks who have been major players in the sport for decades to come together to step into the OTT realm, I believe it can be successful. Something that is a benefit to subscribers of both WWE Network and UFC Fight Pass is both networks have a deep catalog of classic content and full events in addition to live programming and exclusive content. One can only imagine what a dedicated Boxing digital network could be for Boxing fans with potentially a plethora of archived Boxing events, live events, magazine style programming, and documentaries, but I am confident that if such a concept were introduced at an affordable price, Boxing fans would embrace it with open arms. For now, the concept of an OTT digital network for Boxing remains merely “A Wish” for this observer, but if progress can be made in this direction much like the other topics on this year’s “Boxing Wishlist” it should be viewed as a great thing for the sport and the fans who support it tirelessly in both good times and bad. We will have to wait and see what becomes of this year’s “Boxing Wishlist” as events take place and news breaks. This observer is very much looking forward to the year ahead.